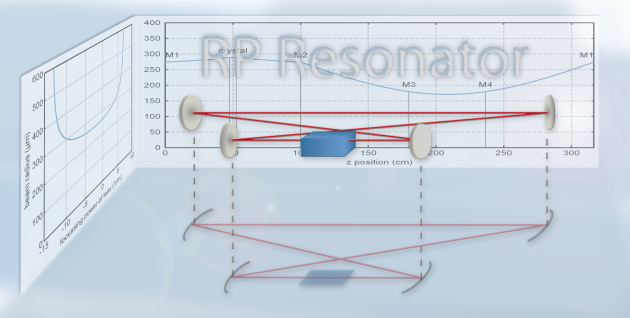 RP Resonator is powerful software for analyzing and designing optical resonators—in particular, laser resonators. Using a comprehensive physical model, RP Resonator provides the user a reliable approach to obtain designs with optimum performance quickly and efficiently. It can calculate a wide range of resonator properties from the resonator design: not only mode radii, but also alignment sensitivities, thermal lensing sensitivities, chromatic dispersion from geometric effects, Gouy phase shifts, frequency degeneracies of resonator modes, etc. The software allows for powerful automatic optimization via freely defined figure-of-merit functions, taking into account whatever resonator properties are relevant for you. It is equally adept at analyzing and/or optimizing existing resonator designs. Due to the powerful script language, you can, e.g., parameterize resonators in convenient ways, create all kinds of diagrams, write outputs to text files, etc. This enormous flexibility is essential for practical work, and probably not found in any competing product. The input wizards form allows you to generate the script code for common resonator types in a simple and straightforward way. For others, just modify the script code accordingly. Beginners may be concerned about the need to learn the script language. However, the input wizards form makes it very easy to get started. Just type numbers or even mathematical expressions into the form fields, and you instantly see the corresponding script code being generated. 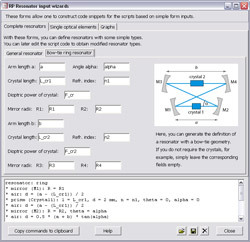 Many different types of graphical outputs are available for visualizing results of calculations. 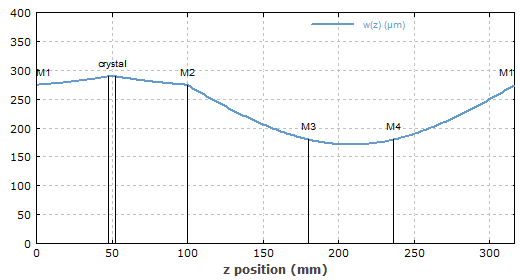 This example shows the beam radius vs. position within a resonator. 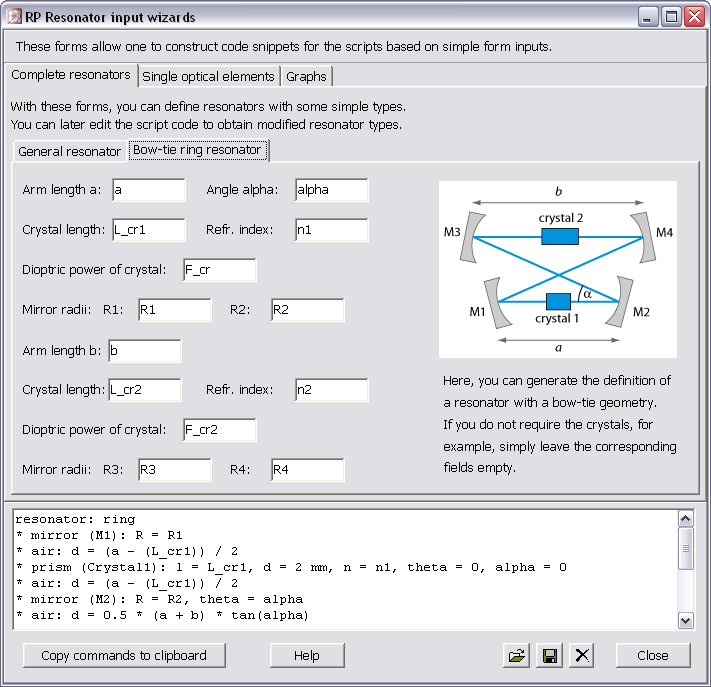 Graphical diagrams are shown in separate windows and using the two cursors provided allows you to measure positions. Graphics can be saved in GIF or PNG format, or copied to the Windows clipboard. The software comes with comprehensive documentation: a PDF manual and an online help system. Competent technical support is included in the license fee, and the support can also be used for general technical consultancy on resonators and solid-state lasers. This software is highly recommended for anyone working seriously with solid-state lasers. Providing reliable and accurate simulation of custom and/or existing designs, RP Resonator is a valuable tool for intensive R&D work and time sensitive projects alike. Coupled with the competent support from RP Photonics, users will realize immediate results. See also the comprehensive description of the RP Resonator design software on the website of RP Photonics, the producer.